Cisco MA-ANT-20 Meraki Dual-band Omni-Directional Antenna with N-type Connector, 2.400 2.500GHz (2GHz), 5.150 5.875 GHz (5GHz); Gain: 2GHz/4dBi, 5GHz/7dBi; Vertical (linear) Polarization, Set of 2. Frequency Range: 2.400 2.500 GHz (2 GHz), 5.150 5.875 GHz (5 GHz); Gain: 2GHz/4dBi, 5GHz/7dBi; Vertical (linear) Polarization, Half power beamwidth / horizontal: 360°, Half power beamwidth / vertical: 45°. The Meraki MA-ANT-20 antenna is a multi-band, omni-directional antenna designed for use with Meraki APs that have N-type connectors. 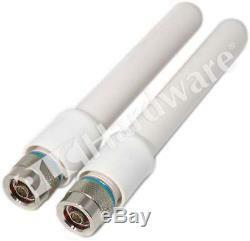 It is a versatile antenna and is suitable for a broad range of applications. 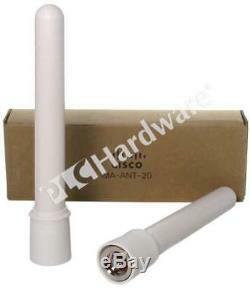 One New in Original Open Box Cisco MA-ANT-20 Meraki Dual-band Omni-Directional Antenna 2/5GHz, Set of 2. The Serial Number in the pictures has been altered for privacy purposes. New in Original Open Box. Are subject to our Policies and Terms. PLC Hardware 11706 Garrison Forest Rd Owings Mills, MD 21117, USA. Mon-Fri: 8:30am - 8.00pm ET. Is an independent distributor of used refurbished and new surplus industrial automation and networking equipment. Or in any way affiliated with Cisco, HP, Rockwell Automation, Siemens and any other listed manufacturers. PLC Hardware sells hardware products only and does not re-sell software licenses. PLC Hardware respects intellectual property of others, and we ask our customers to do the same. Customer acknowledges and agrees that PLCH does not provide any operating system software or software right-to-use licenses with the products it sells. 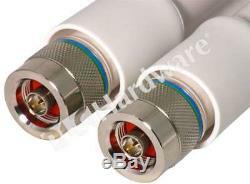 As PLC Hardware is not an Authorized Distributor of the products. All listed logos, trademarks or service marks are property of their respective owners. 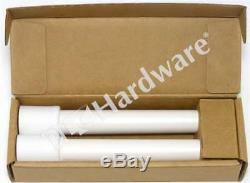 The item "New Set of 2 Cisco MA-ANT-20 Meraki Dual-band Omni-Directional Antenna 2/5GHz" is in sale since Thursday, September 20, 2018. 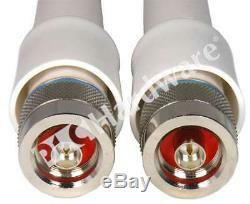 This item is in the category "Computers/Tablets & Networking\Enterprise Networking, Servers\Directional Antennas". The seller is "baltisales" and is located in Baltimore, Maryland. This item can be shipped worldwide.